Welcome to Day #7 of Chocolate and Banana Theme Week. I'm ending Banana Week with two more frozen desserts—the first is from the Eastern U.S., and tomorrow's (bonus Day #8 entry) hails from the West. 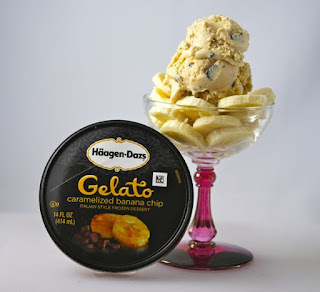 Today's Caramelized Banana Chip Gelato "Italian Style Dessert" was from Haagen-Dazs (a division of Nestle Ice Cream, that originated in the Bronx, NY). I couldn't resist piling this gelato atop fresh banana slices. I was hoping to create an homage to a large exotic looking (maroon-colored) banana flower. Instead it looked like a tribute to cartoon character Marge Simpson* and her famous, if slightly askew, beehive hairdo. No matter. This caramelized banana gelato with chocolate chips was sweet, creamy and delicious with a hint of bananas foster** flavor. You could serve this gelato with sauteed or flambeed banana slices and whipped cream if you wish; however, I'd suggest eating it unembellished. You don't really need chocolate sauce and toppings here. And, the chocolate chips provide periodic bursts of chocolate flavor already. *Marge Simpson is the lovable wife of cartoon protagonist Homer Simpson, on the long-running television cartoon series, The Simpsons, that debuted in 1989. Marge sports a very tall tower of beehive-style hair, that sometimes seems to lean to one side. **Bananas Foster is a dessert—made with bananas, vanilla ice cream, butter, brown sugar, cinnamon, and dark rum—that became famous at Brennan's Restaurant in New Orleans, LA. This was a city that served as a destination port for bananas coming into the U.S. in that time, and perhaps an example of taking advantage of "local" ingredients. I saw this dish flamboyantly prepared at a restaurant many years ago in the southeastern U.S.; and my fascination grew as the server lit it on fire.